by Brianna Crandall — November 9, 2018 — Ditek, a 30-year US-based provider of surge protection solutions for the commercial and industrial market, recently announced the launch of the new Deflector Series Surge Protective Devices. With its audible alarm, flashing LED indicator and remote notification capability, the Deflector surge protector lets the user know in three ways when it requires attention. Unique rapid-replacement modules make it possible to have the unit up and running again in only a few seconds. The surge protector is conveniently wall-mountable, with no additional enclosure required, allowing it to be placed in close proximity to core systems or devices that warrant the highest levels of protection. The Deflector Series makes it even easier to keep fire alarm panels — or any mission-critical 120-volt device not exceeding 20 amps — safe from damage or destruction from power surges. Up until now, it’s been a problem for users who may not see a visible out-of-service indicator until it’s too late and their equipment has been damaged by a power surge. The Deflector solves that problem with a unique audible alarm that can’t be ignored. The Deflector is ideal for convenience stores as owners/operators will know immediately if a power surge puts their facility out of commission, and it would take only three seconds to pop in a new module and have it working again. The first product in this new series, the DTK-DF120S1 Deflector Series Surge Protector, is a 120-volt dedicated circuit protection device designed to minimize damage from AC supply voltage spikes by isolating incoming surges that originate from lightning strikes and other sources. The device is simple for a licensed electrician to hardwire into a circuit, with no enclosure or rack required. When the Deflector does its job by absorbing a power surge and stops functioning, the surge protector sounds a loud audible alarm and an LED flashes, indicating that the module needs to be replaced. Intelligent notification is also available via dry contacts that can be connected to alarm panels to alert central station monitoring that the module needs replacing. With the Deflector Series, you’ll always know when the surge protection on your critical devices and systems requires immediate attention. When it goes, you’ll hear it and see it, and it’s a true rapid-replacement for the module. Whether it’s a fire alarm panel or a whole rack of servers, our new Deflector Series will best protect every device powered by 120 volts. 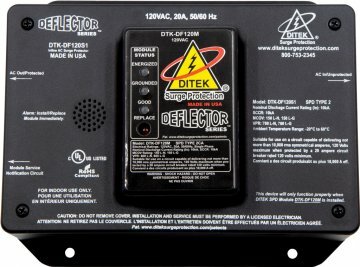 For more information about the new Deflector surge protector, visit the Ditek website.